This Event has been read: 586 times. This wine comes primarily from the Y Block at Bien Nacido Vineyard in the Santa Maria Valley area of northern Santa Barbara County. The block was custom planted for Qupé in 2005 on gravelly river bench soil, directly behind the winery. All of the components were whole cluster pressed, chilled overnight in tank, and then transferred to barrel for complete barrel and malolactic fermentation. Aged on the lees for 9 months in French oak Burgundy barrels from the Francois Freres cooperage (15% new), before blending and bottling. The 2015 Qupé Chardonnay “Y Block” is very traditional in style, with fresh and crisp mineral notes, lemon zest and a touch of oak on the finish. Enjoy over the next 2-3 years with seared scallop pasta dishes or simply by itself with a great Beach Boys album. A Modern Red is Qupe’s take on a classic Cotes-du Rhone. This blend of Syrah, Grenache, and Mourvedre has lots of bright, well-rounded fruit with savory hints of pepper, spice and earth. This completely handmade wine spends 16 months in neutral French oak barrels before the master blend is assembled. I’m a big fan of cool climate Grenache! The South Central Coast is one of the only cool growing areas where Grenache can consistently ripen without getting rained on. The aromas are heady and spicy, with a black pepper character normally associated with Syrah. It has that classic wild cherry aroma as well. In the mouth it is full bodied without being heavy, great acidity and that small addition of Syrah helps it sneak in just under 14% alcohol. Drink this young for its spicy exuberant fruit, or put it in the cellar for 10-15 years to drink at its best! This is one of the top vineyard sites for Syrah in California and this wine is always a candidate for a decade in the cellar. The fee for this tasting and dinner is $75 + tax, for reservations call 954-523-9463 or e-mail andy@winewatch.com. Pioneers are what made this country great, people with a vision and determination to go where no man has gone before, to conquer new frontiers and to be the first to say- “I did that”. Although people with vision have a focused approach to their business, the most interesting talents never loose sight of the little pleasures that their labors afford them to enjoy while they are working toward their goals in business. One of the most interesting pioneers of the wine industry in the central coast is the soft spoken, humble and articulate Bob Lindquist. Santa Barbara was the place where he entered into the wine industry and when he began his tenure in the wine business this area was virgin territory and bob was just beginning to realize his true passions in life. The county's oldest winery, the Santa Barbara Winery, was founded in 1962, just a few years before the Los Angeles Dodger’s 1965 World Series. It was this single event that galvanized young Robert Neil Lindquist’s status as a “die-hard Dodger fan”. At the same time, the sixties music scene was another electrifying force in his life. Both these passions continue to share a spot in Bob’s life with a third, wine which affords him the luxury to enjoy the other two. In 1975, after working harvest at his first winery job, Bob discovered the potential of Santa Barbara’s winegrowing region at his next job, opening and managing a tasting room in Ventura County. While managing a retail shop in Los Olivos, Bob’s career took what some thought to be a bad hop. He got fired for attending a Kinks concert against the wishes of the shop owner, but fate intervened and he was immediately hired as Zaca Mesa Winery’s first tour guide—a job that included cellar work. This winery was like a breeding ground for winemakers from this area as many of this areas most respected wine personalities worked here at one time. Two of the most influential winemakers that worked here during his tenure were Ken Brown who later founded Byron Winery and Jim Clendenen founder of Au Bon Climat Winery. Jim was the one who taught Bob the basics and inspired him to become a winemaker which he did by founding Qupé in 1982. While continuing his work at Zaca Mesa he bought barrels, grapes and traded his services for the loan of the equipment in the cellar. For his first vintage he produced Syrah, Chardonnay, and a rosé of Pinot Noir. Soon, Bob’s love of the assertive and complex wines of the Rhône Valley led him to focus Qupé on the production of Rhône varietals, particularly Syrah. Chardonnay continues in the portfolio because of Bob’s connection to the wonderful fruit sources in the Bien Nacido Vineyard. In 1989, Bob joined forces with his mentor and friend, Jim Clendenen, of Au Bon Climat. Together they built a winery building on one of the top vineyard sites in the area. Qupé Wine Cellars/Au Bon Climat Winery is located on the Bien Nacido Vineyard in Santa Maria, California. Bob and Jim share this production facility and together they manage the production and sales support staff. Jim Adelman is the General Manager and also shares winemaking duties. Once a year, during harvest, visiting winemakers and wine professionals with various backgrounds (many from different states and countries) in the wine business come to work with Bob and Jim at the winery to share techniques and ideas. This open exchange of ideas is one of the secrets to the individuality of these wines and the continued success that both Bob and Jim’s wines have enjoyed. 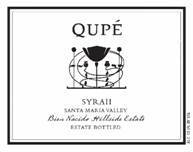 Focusing on fruit grown in the Central Coast appellation of California, Qupé produces Rhone varietals and Chardonnay. A majority of Qupé’s wines (about 50%) are made from grapes grown on the Bien Nacido Vineyard, where the Syrah and Chardonnay are planted and grown to Bob’s specifications. In addition to Bien Nacido, Qupé also farms (using organic practices) a 14 acre vineyard in Los Olivos called “Ibarra-Young Vineyard.” The balance of the Qupé wines are made from grapes grown at various vineyards in the Central Coast appellation of California. Bob and his wife Louisa have recently purchased an 80 acre vineyard site in the Edna Valley where they began planting in the spring of 2004. 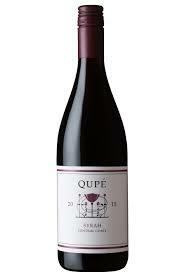 Qupe’s Central Coast Syrah has become one of the benchmark wines in this category. This began when the 1988 vintage of this wine scored (90 points) in The Wine Spectator catapulting Qupe winery into the California Syrah limelight, it has been one of the leaders in this category almost every vintage thereafter. This 2002 Central Coast syrah is a blend of 86% Syrah, 6% Grenache, 4% Counoise, 3% Mourvèdre and 1% Cinsault. The grapes come from eleven different vineyards in both Santa Barbara and San Luis Obispo counties with 49% from Santa Barbara County, 31% from Paso Robles and 20% from Arroyo Grande Valley. The largest vineyard sources are: Bien Nacido (Santa Barbara) 21%, Rancho Arroyo Grande (Arroyo Grande) 20%, French Camp (Paso Robles) 18%, Reid (Paso Robles) 13%, and Stolpman (Santa Barbara) 6% followed by smaller percentages from Premier Coastal, Colson Canyon, Ibarra-Young, Purisima Mountain, Whitehawk, and Alisos Vineyards all in Santa Barbara County.